Burgees – Do You Have a House Flag? Update September 2015: The original house flag described in this blog post lasted three years. A bright new one represents Magnolia and its crew now. Also known as an owners private signal, it’s fun to have a burgee to represent you when you are aboard and in command. The flag goes with you. It can be representative of your name, your boat, a hobby. And burgees are fairly easy to make. You do need the right materials and a design. What symbol or design would be fun, easy to make and see from atop the flag halyard? What colors do you want (not too many)? What size and shape? A pennant or swallowtail or rectangle would be traditional for a house flag and easy to make. How about a border? One-sided or two-sided? There are no limits! I did an easy pennant design depicting our initials as my husband, the engineer, likes to write them: A2. It’s red with white letters. Clean and simple. Secret trick: I used insignia fabric for the applique letters and numbers. There are limited colors. It was easy to stick the letters on. Then sew them down. Sketch out a design and make a pattern. Since I was using letters I downloaded a template of a clean, easy-to-read large font. Cut out the design backwards on the underside of the insignia fabric. Remember it has a right side and the sticky side. I cut two sets since I decided to make a two-sided pennant burgee. Cut out two flag panels if making a two-sided flag. It is 12″ on the hoist and 19″ long. 14″ would have been ok too. It’s easy enough to copy the shape of another burgee. Mark the flag tape and border if you are adding those. That will give you a better feel of the space for placement of the design. Attach the design to the flag. Watch positioning. The second side will have the letters or design in the opposite direction. Stitch around the edges of the design. A zig zag stitch is nice here. Sew the flag panels right sides together leaving an opening to turn it right side out. I double stitch the seams for durability. Turn the flag right side out. Carefully push out any points or corners. Lightly iron or “finger press”. Don’t burn the nylon with a hot iron. Sew on the flag tape on the hoist side. Topstitch or add border if you are adding it. Pay careful attention to points and corners. Back track or double stitch. You can sew an “X” or box at these points. It will help reduce fraying from the wind. Add grommets positioned evenly on the flag tape to finish the flag. (You’ll need a grommet cutter or sharp scissors, a grommet setter, hammer and hard surface. A grommet set will have instructions.) Hoist with clips tied on to a spreader halyard! This project takes about 2-4 hours. A Gin Pennant means that the Wardroom is inviting officers from ships in company to drinks. The origins of the Gin Pennant are uncertain, but it seems to have been used since the 1940s and probably earlier. Originally it was a small green triangular pennant measuring approximately 18 by 9 inches (460 by 230 mm), defaced with a white wine glass, nowadays the gin pennant is a Starboard pennant defaced with a wine or cocktail glass. 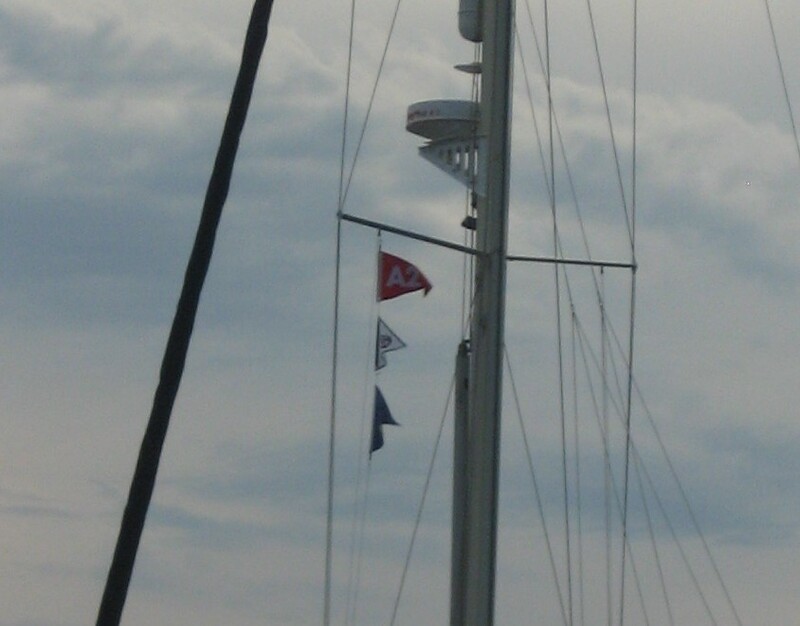 Its colour, size and position when hoisted were all significant as the aim was for the pennant to be as inconspicuous as possible, thereby having fewer ships sight it and subsequently accept the invitation for drinks. The Gin Pennant is still in regular use by Commonwealth Navies, such as the Royal Australian Navy (RAN). Within the RAN it is common practice, whilst in port, for junior officers of one ship to attempt to raise the Gin Pennant on the halyard of another ship, thereby forcing that ship to put on free drinks for the officers of the ship that managed to raise the pennant. If, however the junior officers are caught raising the pennant, then it is their ship that must put on free drinks within their Wardroom. Usually this practice is restricted to Commonwealth Navies; however, prior to increased force protection, RAN officers have successfully raised the Gin Pennant on a number of units in the USN. Love this idea! You are so creative, Annette. We have a personal boat flag made about 10 years ago, but don’t fly it very often. Afraid it will wear out. 🙁 Not as good a seamstress as you are! I really like the A2.